I haven't seen any other Laika animation prior to this. I haven't seen Coraline, I haven't seen Paranorman, and I haven't seen The Boxtrolls. 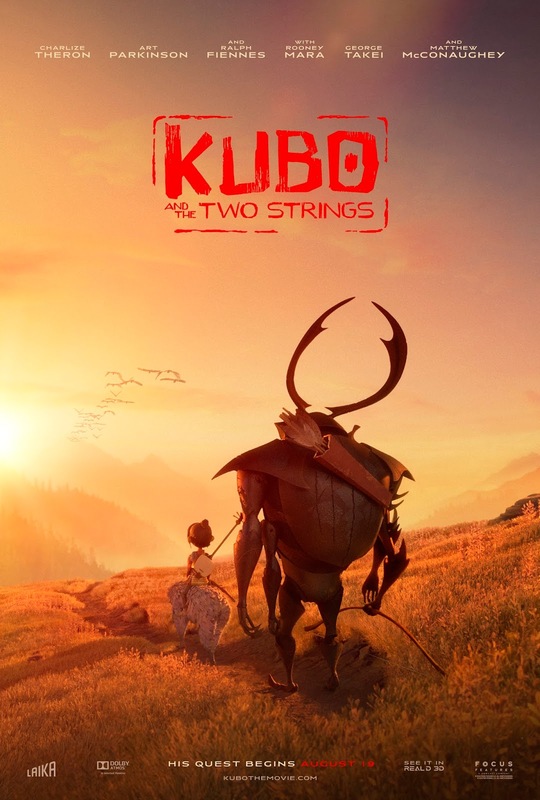 In fact, Kubo and the Two Strings is the first stop motion animation I've seen since last year's excellent Shaun the Sheep Movie, so the range of this particular visual style had somewhat slipped my mind. Two minutes into Kubo, however, and I was grasped again by its wonder. Animation became a sea of endless opportunity the moment it made the leap to the digital world, which is obviously a great thing, and films like Tangled and How to Train Your Dragon and Inside Out use the feature tremendously well. That said, it's impossible to deny the immense feeling of satisfaction when you watch a stop motion film like Kubo, and suddenly realise that the majority of the frame was hand crafted and physically acted out in stop motion. It's an astonishing realisation, and the fact that it's easy to forget that the film isn't fully digitalised is a testament to the beauty of the visuals on display here. What is frustrating, though, is that so much effort has gone into Kubo's visual design that, unfortunately, the narrative loses its way about half way down the line. I'm already making this out to be a much bigger deal than it is. Let's get things straight. Kubo follows a boy, named Kubo (Art Parkinson), who cares for his ill mother in the years after his father's death. In his spare time, he frequents the local village, where he performs visual stories inspired by tales of his father, using paper origami and his magical abilities to bring these stories to life. He is warned by his mother not to stay out past dark but, naturally, he does, and his evil Aunts appear before him, attempting to steal his eye for reasons that become apparent later on. His mother defends him, though, and soon Kubo finds himself far away from the village, accompanied by a living version of his toy Monkey (Charlize Theron) and a man/beetle hybrid named Beetle (Matthew McConaughey), where he must journey to find the three pieces of armour that will help defend him from his Aunts' evil plans. It's tough to detail the plot of Kubo without giving away too much, especially since everything moves at an impressively quick pace early on. It's a fairly simple plot, but it's effective: it features welcoming characters, it touches on some thoughtful ideas, and it sets up a whole lot of mystery. About half an hour into the film, and in an appropriate place to do so, Kubo brings out its first little twist, and it's pretty great. The issue? About twenty minutes later, it pulls out that exact same twist again on a different character, but all of the impact is lost. It's an incredibly bizarre storytelling choice for the film's writers to make. When the twist happens the first time around, it's a pleasant shift in both narrative and character direction. It takes the plot on a new route and invites a massive change in character dynamics, the way a good twist should. The film's pacing is off, though, as the moment we become accustomed to the changes to the status quo, the film just kick starts that same twist again on a different character, but without the aftermath to truly understand the impact that it has. The result is just a bit messy. When we've already seen how intricate Kubo is with its characters and its themes, we want it to pull this off again the second time around, to shift the narrative and character dynamics even further. The film isn't interested in doing it a second time though, resulting in a twist that, while beneficial to the overall story, has little impact in the moment. It's a real shame, as the moment itself deserves to be powerful, but it's tough to really focus on the scene without thinking "Hang on, haven't we just done this?". Before you can try to push that thought aside, the film throws us further into the story without even thinking about the consequences. After such a promising opening half, this second twist - which comes at the end of the second act - lands a bit like a dagger in the stomach, just not for the right reasons. Thankfully, though, it's about the only misstep that Kubo makes along its entire journey. As discussed earlier, the film is simply stunning to look at. The scenery is impressive in the earlier sequences set in the village, as the frame is filled with the kind of depth that one just wouldn't expect from a stop motion feature. The character design is also excellent; watch as Kubo's hair moves freely around him, and then let your mouth hang wide open as you realise that this was achieved by hand. Both Monkey and Beetle are interesting visually, and unlike anything I've ever come across in an animated film before. In what is arguably the film's most exciting sequence, the trio are forced to remove a sword from the skull of a giant flame-eyed skeleton that's trying to kill them, and the action flows as smoothly as it does in a live action feature, except this has the added bonus of some downright frightening creature design, The detail that goes into the creatures across the entirety of Kubo is astonishing, and when it culminates in Kubo fighting against a neon blue fish-dragon it becomes something truly special indeed. In terms of visual design alone, Kubo is the film of the year. What also pushes the film towards greatness is its surprisingly focused analysis of a fairly well worn convention. An orphaned child - or, indeed like here, a child with just one parent - is an extremely archetypal character, but it's a trope rarely explored as deeply as it is here. Kubo's treatment and love for his mother in the film's early scenes do a perfect job of defining their relationship, but it's the way in which he talks about his father that these themes truly flourish. Kubo's father isn't used as some off-screen presence that pushes the protagonist to victory. In fact, he actually plays a rather large role in the direction the plot begins to take once Kubo is separated from his mother. The film understands this trope deeply, and it binds it into a story that simply could not work without it, allowing what is a fairly rote character type to feel as if it's never been told before. When the film reaches its final scene, and you realise what the closing shot of the film is going to be, you're likely to have a lump in your throat and a tear in your eye by the time the lights come back on. It may not have taken the smoothest route there, but Kubo unquestionably ends in the right place, at the right time. The film's final sequence, which features no character besides Kubo himself, is unreservedly beautiful, both in visual design and thematic resolution. In terms of where this compares to other animated films this year, I'm not quite sure. It's head and shoulders above the mostly disastrous Secret Life of Pets, and it definitely doesn't knock the mostly perfect Zootropolis from 2016's animated throne. I think I'd place it marginally below Finding Dory for now, but a re-watch of both films could swap their places. Kubo wins for sheer visual inventiveness and emotion (seriously, that final sequence was a hell of a lot more moving than I expected it to be), but Dory's narrative is more focused and the humour flows more smoothly. That isn't to say Kubo isn't funny - it definitely is, even if most of the jokes come from McConaughey's Beetle and can't quite match the tone of the first act. Kubo is the visual achievement of the year, but its story just can't get past its sketchy handling of that second plot twist. With just some minor tweaks, it could have landed perfectly, and I'd be sat here describing the perfect animated film, but alas that is not the case. Kubo is terrific fun, and it's suitably dark for a film about a fatherless child defending himself from his evil family, but it doesn't quite hit every nail on the head. Still, with the time and effort and love and care that has so obviously gone into making this world real, who cares? To Summarise: Funny, emotional and breathtaking to behold, Kubo and the Two Strings makes for a refreshingly dark animated adventure, even if its narrative focus can't quite match that of its visual design.